You have to hand it to the Santa Claus myth: it sure knows how to extract good behavior from children. In many senses, it’s a bit of a police state mentality: Big Brother (Santa) is always watching, so you had better be good in order to obtain a reward (presents) rather than be punished. The punishment has varied through the years, landing in recent years (relatively speaking) on coal. However, this was not always the case, as the myth of Krampus tells us. 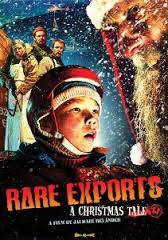 Bearing this in mind, Rare Exports: A Christmas Tale manages to explore the dangers of polar classifications of behavior, giving the most credit to those that have struck a balance between good and bad behavior. Nothing like a terrifying mythological figure to inspire good behavior. Rare Exports gives us an innocent child that exhibits incredible behavior, which marks him as the bearer of truth. Pietari (Onni Tommila) is very young mentally and innocent, from the closing of his eyes in his father’s slaughterhouse to the way that he had to have Santa’s non-existence explained to him by his friend Juuso. Pietari still wants to believe, and in doing so, begins researching Santa… which leads to the terrifying discovery (and melding) of the Krampus myth with the long-held tradition of the benevolent Saint Nicholas that brings presents as a reward for good behavior. In his innocence, he first tapes the December 24th date shut on his advent calendar, then staples it later on to ensure that the bad aspect of Santa doesn’t visit. This is something a young child would do, someone who still believes in the magic of superstition; that’s a great quality to have, to be honest. By all means, Pietari is not a bad kid: he’s curious, yet he tries to shield himself from scary things. He problem-solves to discover the nature of the myth, and he is the one that comes up with the plan to save the children from the real Santa. He exhibits bravery in the face of a crisis, telling the adults while airlifting the other children to safety, “You do your job, I’ll deal with this!” When it comes time to open the gate to the reindeer pen in order to trap the elves, Pietari willingly sacrifices himself to open the door, putting the safety of others ahead of his own life. The synthesis is nothing short of an amazing kid. If you ask me, that’s not only a clever child, but one that still has a sense of wonder – a difficult feat in this world – as well as a heart large enough to save others over himself. An altruistic kid is tough to find; someone like that should be considered good. However, let’s not forget a key piece of information: Pietari was marked for abduction, which is reserved for children that have been deemed naughty, which seems incongruous with how he is presented. The trap that his father, Rauno (Jorma Tommila), laid out – a spiked pit – is what separated Pietari from the other children, and allowed him to act as the agent of change in the story. When the elf is extracted from the pit, Pietari discovers a sack and a doll, which is the method of abduction and replacement that befell the other children in town. Think about that one: this sweet kid that still believes in Santa – who, outside of being a normal, curious child that explores the world around him and sets traps to guard his home against invaders – was destined for the same thrashing as Juuso. Juuso is not a character that we are supposed to like from the get-go: he refers to Pietari as a baby, then later calls him “a kid in a diaper” when Pietari shows him his makeshift armor. He dismisses Pietari’s research as a fairy tale, then calls him an idiot before placing the blame of the dead reindeer on Pietari. This isn’t a kid that we associate with as being kind, caring and good. There’s a clear difference to the audience between Pietari and Juuso, yet the standard of their behavior remains the same to the elves. In this respect, no one can really meet the expectations of behavior that is held up as “good,” which means that only adherence to a set of rules deemed ridiculous by the workers at the beginning of the film can ensure that you will not be harmed. Being a good person is simply not enough: the children must conform to a rigid system, regardless of good intention or outcome. That’s fairly extreme, and points to the dangers of this type of thinking. No winners here in the good behavior game. Really, the fate of Santa and the elves examines the need dismantle this type of extremism. When we first hear about Santa, he’s not only buried underneath a mountain, but he’s been encased in a block of ice to ensure that he does not escape. In essence, the representation of unattainable goodness must be contained and placed out of sight – quite literally buried – in order to ensure the safety of the children. There is no reasoning with this being, either: once the parents come to rescue their children, the plan then becomes an execution mission: Santa is blown up after his horns have been claimed as a type of trophy. The elves are then re-educated throughout the year and shipped out for profit, ensuring that our main characters are not left to struggle while spreading joy throughout the world. In the end, capitalism and shades of gray win on the surface. But if you look a little deeper, you’ll see the mercy in what Pietari suggests: to retrain the elves, he gives them a purpose. Very easily, these elves could have been left for dead – however, the child insists that they are retrained for a better purpose, one that manages to fulfill the needs of the struggling inhabitants of their small town. Instead of conforming to those poles of behavior – either all of it’s good or none of it’s good – he chooses to enact a sliding scale that opens up contact, affection and, ultimately, survival. And really, if you think about it, extremity takes many forms, from religion to politics to a simple refusal to view another’s experience. That Pietari – good, cerebral, innocent Pietari – is able to see through these polar opposites to create a middle ground that serves all is remarkable. His shades of gray in a system that only wishes to see black and white create a future with security and comfort. The message of Rare Exports then becomes a caution against extremity, as well as an acceptance that sometimes, a good person can exist inside of poor actions. To err is human, and to expect that someone can be good/conformist all of the time is simply not feasible. To punish through physical harm is even worse, for it induces behavior rooted in a fear response rather than through actual intent to be a good person. Capitalist ending aside, this film serves as a reminder that no one is perfect, but if you’re willing to face the truth, act to save others, and help someone else find his or her way despite long-held beliefs, there is a chance for all of us to survive together. Maybe there’s room enough for all of us in this world.